Welcome to the Byron and Annie Kirkwood's Internet Home Page. In case you haven't visited with us lately, you may be noticing that we've made a lot of changes and additions. You might want to BOOKMARK our page now before you forget. My name is Brian L. Kirkwood and I the oldest son of Byron R. Kirkwood. My father passed away on September 20th (2002), only 3 weeks after my Grandfather (Orval Kirkwood) passed away. His service was held at Greenwood Funeral Home in Ft. Worth where he was also buried. He was 56 years old and died suddenly of a pulmonary embolism while in a hospital in Tulsa. My father was a great man and will be deeply missed by all of his family and friends. The family asks for your prayers as we work though these rough times. My (Byron) father, Orval Lee Kirkwood, passed away on August 28th (2002). His service was held at the Southwood Methodist Church in Oak Cliff (Dallas) where he had been an active member for 27 years. He was buried at the Veterans National Cemetery in Dallas. He was in the Navy and a veteran of War World II. He was 76 years old and been ill for almost a year and finally died of acute leukemia. Pictures from our annual August 15th, Mary Day (2002) get-to-gather at Lake Tenkiller, with a message from Mother Mary. The "Mary's Message/Newsletter" (Peridico Mensaje de Mara Virgen) is being translated into Spanish (espaol) by a nice lady, Claudia. Her translations are on the main "Mary's Message" page. We will be adding others are they are made available. Shirley MacLaine asked Byron and Annie to be on her IE (Internet) radio talk show (taped to aire later). Byron's interview was how to physically prepare for earth changes and emergencies. Shirley's request for Annie was to discuss Mary's messages and particularly the prophesies. Annie asked Mother Mary for an update on the predictions and we have added them to our web page. These are the first new predictions that Annie has allowed to be made public since the release of Mary's Message in 1991. To hear the interviews, you have to join IE Radio. To join IE log onto her website at www.shirleymaclaine.com. Annie newest book, Mary's Message of Hope, Volume Two, just arrived. This is the continuation of the messages given through the newsletter, Mary's Message/Newsletter. My son, Brian's ham radio transceiver was used in Chuck Norris' upcoming film, The Bells of Innocence. If you see the movie, one of the three amateur radio radios is Brian's (ham call sign KB5TDJ). Annie's grandson, Jonathan Ortega married Beatrice Alvar, on Saturday November 17th at 4PM at a Catholic Church in Oak Cliff (Dallas), but the Inter-Continental Hotel in Addison Texas wouldn't accept them on their wedding night. Here's the details. Annie received a message from Mother Mary regarding the Sept 11th attack on the World Trade Center and the Pentagon. Our son Brian has a created a web page to pay our respects to those lost in Tuesday's tragedy. Here's an interesting phenomena that we found on a picture of Annie and her son David, taken below a picture (print) of Mother Mary and baby Jesus, by artist Glenda Green. 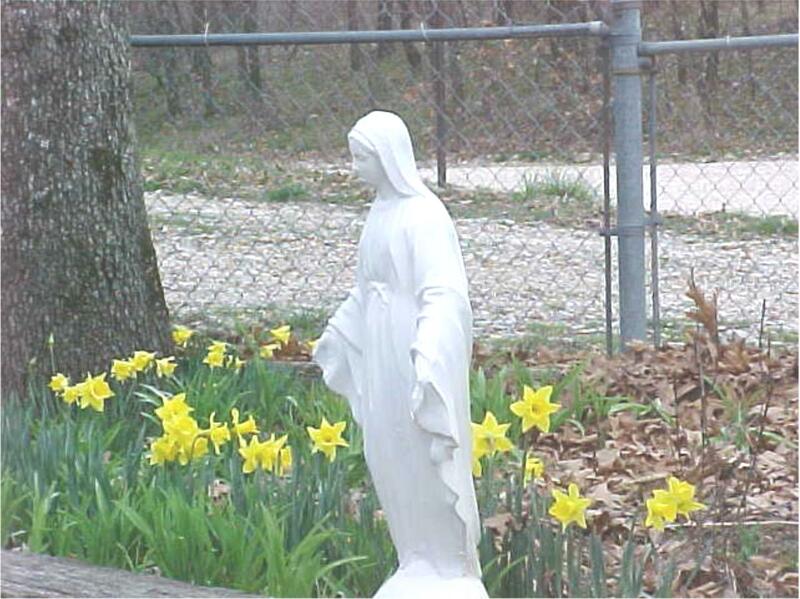 Mary Day 2001 message and pictures. 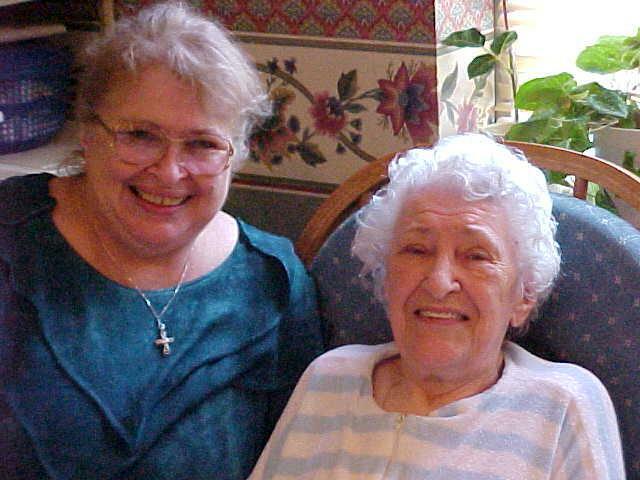 Annie's mother, Mary Griffin, passed away Thursday morning, May 10th at 8 AM (2001). She was 91 years old and had been in ill health for quite some time. She had been in a nursing home for the last few years. The service were held at 3:30 PM Monday 14th, at the Greenwood Funeral Home in Ft Worth, TX. Annie wrote an appreciation letter about her mom in the December/January issue of the newsletter. Picture of Annie and her mom, from last year. Read about Annie's miracle flowers in the April/May issue (2001) of the newsletter. Click on picture to see large version. The latest Mary's Message/Newsletter April/May 2003 (issue #69) is available. B&A Products has established another line of products on a separate web page. It is called FirstResponderSupplies.com and is first aid and medical supplies for emergency service providers. Take a look at what we are offering for First Responders and EMTs by clicking on the FirstResponderSupplies.com link. If you have read the book, Bioterrorism: Secrets for Survival by Duncan Long, we are now carrying this book and some of the products he recommends to be able to cope with a terrorist biological attack. Here's a list of our newest additions to our product line offering: check it out to see the neat items we have added. Q&A (Question and Answers) page. Commonly asked questions about details in "Mary's Message" and preparing for Earth changes. Byron's Preparedness Information from the previous newsletters. Chemtrails come to Bunch (Oklahoma) (plus we have links to several other Chemtrails pages). Information about the Kirkwood's books in other languages. I've added a little humor, check out some of the jokes and humor that have been submitted and my own observations about Oklahoma drivers: A little Inter-Net Humor. Annie is available for spiritual readings.